What do I wear with: re-souL “Nova”? Each Wednesday we’ll answer the on-going question: “What do I wear with these?” It’s a question we get quite often here at the shop and we love giving suggestions when helping our customers. This week we feature the re-souL Nova. This week’s inspiration for “What do I wear…” comes from our very own re-souL collection. 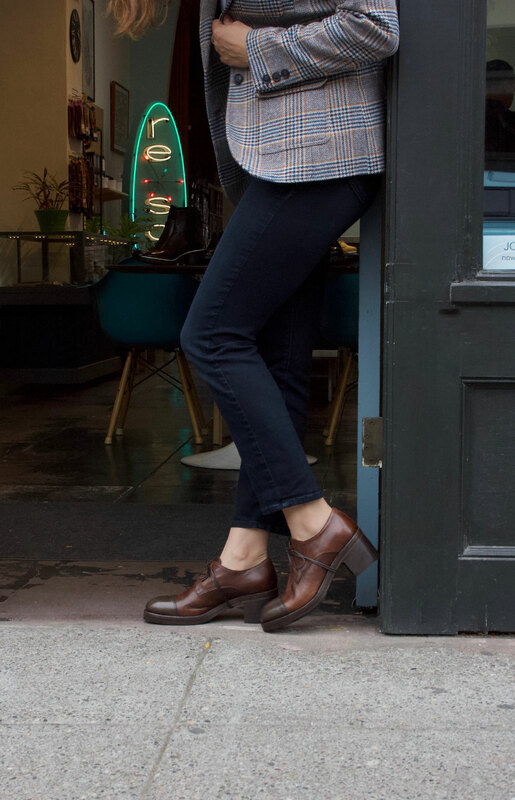 This italian smoking moc oxford is comfortable but still has a no fuss cool vibe. The perfect choice for a more polished option to a sneaker. Pair them with your white jeans and a classic breton for a classic preppy look or with denim pieces for a laidback carefree day. It’s a versatile pair of shoes that will be sure to become one of your well loved ones too. > re-souL collection “Nova” smoking moc in Amber leather, made in Italy. > Aunt’s and Uncle’s “Raisin” bag in tan leather, please contact for price and availability.